"This is made with tofu and tastes like an Orange Julius drink. No one in your family will know they're eating tofu! Be sure to use SOFT tofu, not firm, or it will taste gritty." 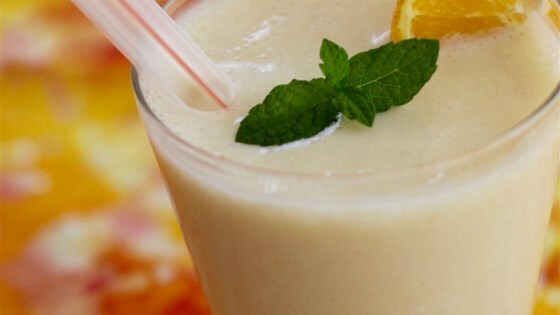 In a blender combine frozen banana, tofu, orange juice, honey and vanilla. Blend until smooth. It was tasty, but I used vanilla yogurt (sometimes strawberry too) instead. Silken tofu is not the easiest thing to find and I always have yogurt on hand. Tastes Good but not Great. very smooth. It takes a few sips to get used to the taste of the tofu...and then you don't taste it. Good with silken tofu, but I bet it would be delicious with yogurt instead. Yum! Very refreshing, and so nice to know it's pretty healthy too! I subbed pineapple juice for oj because it was what I had on had -- worked great. Will definitely whip this up again soon!